Cheyenne County is the sixth-least densely populated of the 64 counties of the U.S. state of Colorado. The county population was 1,836 at 2010 census. 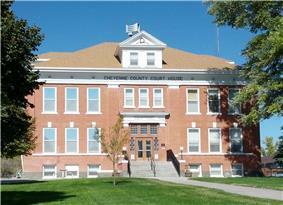 The county seat is Cheyenne Wells. Cheyenne County was created with its present borders by the Colorado State Legislature on March 25, 1889, out of portions of northeastern Bent County and southeastern Elbert County. It was named after the Cheyenne Indians who occupied eastern Colorado. According to the U.S. Census Bureau, the county has a total area of 1,781 square miles (4,610 km2), of which 1,778 square miles (4,600 km2) is land and 3.2 square miles (8.3 km2) (0.2%) is water. As of the census of 2000, there were 2,231 people, 880 households, and 602 families residing in the county. The population density was 1 people per square mile (0/km²). There were 1,105 housing units at an average density of 1 per square mile (0/km²). The racial makeup of the county was 92.87% White, 0.49% Black or African American, 0.76% Native American, 0.13% Asian, 5.11% from other races, and 0.63% from two or more races. 8.11% of the population were Hispanic or Latino of any race. There were 880 households out of which 34.10% had children under the age of 18 living with them, 59.30% were married couples living together, 5.70% had a female householder with no husband present, and 31.50% were non-families. 29.00% of all households were made up of individuals and 12.40% had someone living alone who was 65 years of age or older. The average household size was 2.50 and the average family size was 3.12. In the county the population was spread out with 28.80% under the age of 18, 7.10% from 18 to 24, 26.20% from 25 to 44, 21.30% from 45 to 64, and 16.60% who were 65 years of age or older. The median age was 38 years. For every 100 females there were 100.60 males. For every 100 females age 18 and over, there were 98.40 males. The median income for a household in the county was $37,054, and the median income for a family was $44,394. Males had a median income of $32,250 versus $19,286 for females. The per capita income for the county was $17,850. About 8.70% of families and 11.10% of the population were below the poverty line, including 12.90% of those under age 18 and 10.90% of those age 65 or over. Old Military Trail - This trail connected Fort Wallace (on the Smoky Hill River in Kansas) to Fort Lyon (on the Arkansas River in Colorado). Omaha Trail - This trail came from Kansas into northeast Cheyenne County and merged with the Smoky Hill Trail east of Cheyenne Wells. Smoky Hill Trail - The Smoky Hill Trail is also called the Butterfield Trail and the Starvation Trail. It followed the Smoky Hill River, crossing Cheyenne County from east to west. Lt. John C. Fremont is known to have used this trail as early as 1844. When gold was discovered on Cherry Creek in 1859, the trail was promoted as the most direct route to Denver from the Nebraska and Kansas Territories. The route was treacherous and earned the name "Starvation Trail." David Butterfield established the Butterfield Overland Dispatch along this trail. The area was Indian hunting grounds. Several military forts were established along the trail to protect travelers. The Kansas Pacific Railway followed this trail through Kansas. The trail split near "Old Wells" (about five miles north of present day Cheyenne Wells) into north and south forks. The north fork of the trail went northwest from "Old Wells" Station through Deering Wells Station, Big Springs Station, and David Wells Station and eventually to Denver. The south fork was first surveyed in 1860, and again in 1865. The south fork ran southwest from Old Wells through Eureka Station to Dubois Station. Then it headed northwest to Grady Station. The two forks joined up again near Hugo. Texas-Montana Cattle Trail - This trail was used during the Civil War. It ran south to north across Cheyenne County through Big Springs Station. Cheyenne County Courthouse in Cheyenne Wells. The courthouse was built in 1908 and is listed on the National Register of Historic Places. Old Cheyenne County Jail in Cheyenne Wells. The jail was built in 1894 and used as a jail until 1961. The structure is listed on the National Register of Historic Places. The jail was designed by noted Colorado architect Robert Roeschlaub, who designed the Central City Opera House and other historic structures in Colorado. The Old Cheyenne County Jail is now a historical museum. The Historic Plains Hotel in Cheyenne Wells. Built in 1919, the hotel is still used as a hotel. Mountain States Telephone & Telegraph Building in Cheyenne Wells. The building's entablature frieze simply says "Telephone" in block letters. The building, constructed in 1927, is currently a museum. Kit Carson Pool Hall in Kit Carson. Union Pacific Pumphouse in Kit Carson. Built in about 1880, the stone pumphouse was used by Union Pacific Railroad's steam locomotives. Wild Horse Mercantile in the town of Wild Horse. Built after the 1917 fire, the store was in continuous operation into the late 1960s. Wild Horse School in the town of Wild Horse. The school was built in 1912.